Have you moved into a house and wondered what type of heating oil you are supposed to put in the tank? Luckily the answer is relatively straightforward. You usually have a choice between two products: Kerosene or Gas Oil. The number of different names for Kerosene means at times it can be confusing trying to figure out the exact oil type you need. Kerosene is also known as Jet A1 kero, standard kero, 28 second oil and, more generically, just “home heating oil”. The vast majority of modern home heating systems use Kerosene to fire their oil boiler. If you operate a range cooker then you might want to learn more about Aga Kero Plus, which is a cleaner burning version of the standard product. Kerosene heating oil is the most competitive heating oil available. This probably explains why it’s the most popular form of domestic heating oil in Ireland, being widely used in oil-fired boilers and cookers. Here at emo.ie, we provide competitive kerosene prices for you to take advantage of. Our easy to use and accurate instant quote system (see top left of this page) allows you to view our kerosene prices for delivery direct to your home. Simply select your preferred delivery option and complete the online secure checkout process. Before the discovery of Kerosene, whale oil was often used instead, so kerosene has changed the face of the oil industry. It is extracted by distilling crude oil, and is colourless and thin – though dyes are added to help distinguish it from gas oil. Some households and commercial customers use gas oil to heat their homes, their business and also for non-road vehicles. 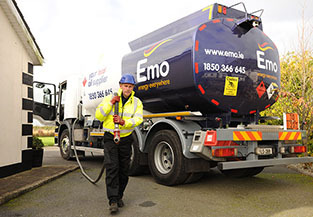 This is why emo.ie sells gas oil as an alternative home heating fuel. In Ireland it gets dyed green to differentiate it from diesel, and it is also known as green diesel, 35 second oil and MGO (marked gas oil).